More Snow is on its way!!! Novice flags have been removed. Standard & Adventure Flags will be out through Feb. 15th. Physical maps can be had at the Rec Department or Stetson's Blacksmith Shop on Oak Street. An online version is available here. Newport High School, Newport, NH - between the track and the woods (see example map for exact location). This is a fun for the whole family orienteering like event. Courses will be located in and around the Newport Town Forest. Each participant will receive a waterproof contour map showing the approximate location of multiple control points / flags. Each flag has a special hole punch attached to it which corresponds to a location on the map bottom. First participant to reach each of the controls, punch its appropriate location on their map and return to the start / finish with map intact wins that course and will have eternal bragging rights. Participants are allowed to decide the fastest route to complete the course. A variety of prizes & awards will be given away for completing a course. There will be 3 courses of increasing difficulty. 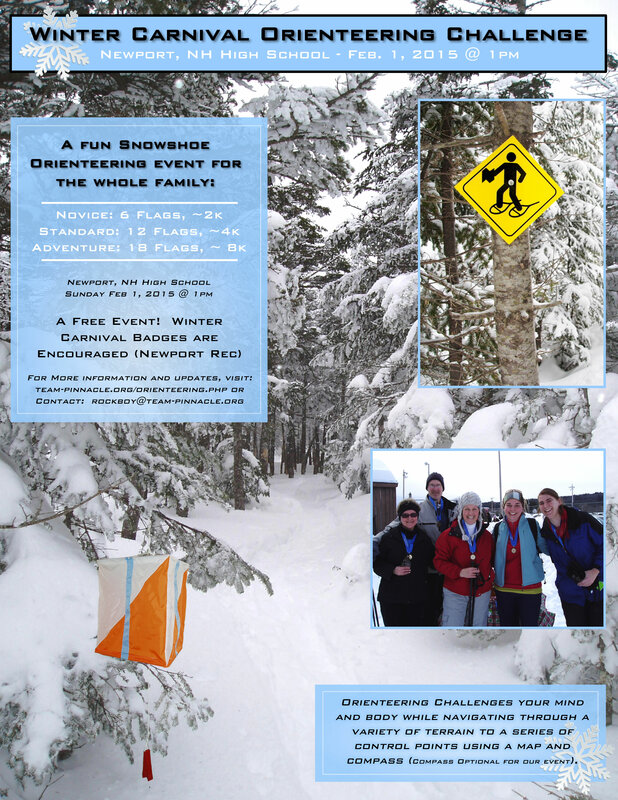 Bring your snowshoes, a smile, and prepare to have fun! This is a fun for all ages course so if you enjoy getting out in the woods, please come play with us regardless or your navigation skills, you will enjoy this course. This course is for those who want a little more of a physical and mental workout. Most people who enjoy an hour of physical activity will enjoy this course. Includes the Novice & Standard flags + 6 more. Area bounded by the Town Forest plus more to the North. This course is for those who expect and desire to be challenged! You will work for these extra flags. They will be in remote and challenging to reach locations. We strongly recommend compasses for this course. Prepare to be out there for 3 hours but a skilled navigator and physically fit person should be able to complete the course in under 2 hours. This is a demanding course. We do not recommend and will discourge people from attempting the Adventure Course who do not appear up to the challenge. Ultimately we want people to have fun, not walk away saying I will never do that again! *Note: course distances and elevation change are calculated based on a reasonably direct line between control points and will be adjusted based on ground conditions (deep snow = shorter courses). Free! Winter Carnival Badges are encouraged. Please RSVP below if you know you are coming so we have enough maps and prizes. There will be metals for the top 3 in each class. 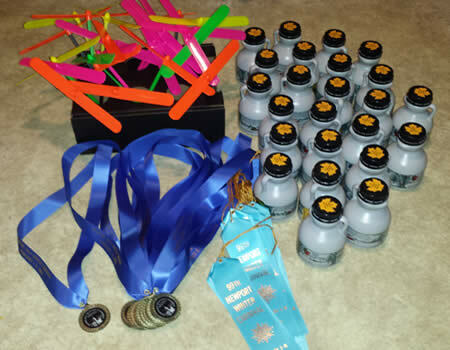 There will also be consolation prizes for anyone completing a course (while supplies last). Please help us get the word out about this event. A PDF & Image brochure of the event for distribution are located on the right. We would like to see Orienteering become a standard fair at the Newport Town Forest. If there is enough interest we will consider a summer event as well as a better map and possibly a perminent course. Do we have to use a compass? No, compasses are used to aid you in navigation but are not required. We do strongly recommend their use for the Adventure Course. Do we have to use snowshoes? No, however, expected snow conditions merrit snowshoes. We STRONGLY recommend traction control devices, if not snowshoes then something like Kahtoola Micro Spikes or Hillsound Trail Crampon (especially for the Adventure course). What affect will snow conditions or the weather have on the event? 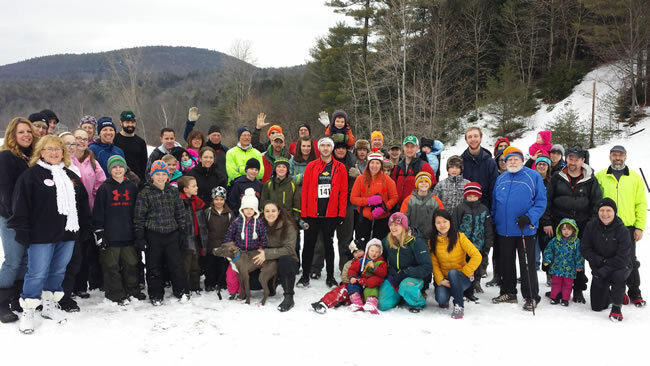 If there is little or no snow, this will be a running event. If there is a snowstorm, bring it on, this is what Winter Carnival is all about. If it is COLD... dress for the conditions, this event will still be held, after all we do not want it warm. In the unlikely occurance of Heavy Rain the event will be canceled. Are the trails going to be open for Non-Event use? Yes, trails will be open to the general public, onlookers, as well as to the event participants. You should also be aware there are 2 main trails, which are open to snowmobilers and others (East / West corridor is Forest to Upper Loop to Baptist Bypass, and the other North / South corridor is Summer St.). 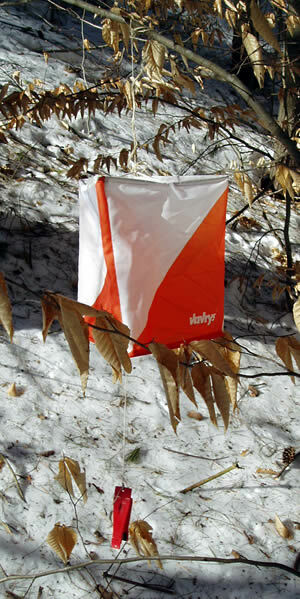 What do you mean by an "Orienteering Like" event? While this will be run in the spirit of an orienteering event, there are significant differences. The primary difference is the quality of the map. This is not a true orienteering map as it uses the USGS base contours and contains few significant and accurate features. There will be few if any location hints so it will be more of a seek and find. Also some control points might require more then just finding the flag to punch your map. Will we be home in time to watch the Super Bowl? It is our hope the event will be wrapped up by 5pm at the latest. If you are not out of the woods by 4pm we will come find you. The most navigationaly challenged Novice should be done in less then an hour, the Standard in under 2 hours. If you are not well on your way to completing the Adventure course by 3 hours we ask that you return to the start line and finish another day, preferably with someone.